Sometimes when we see a poet perform we might see some new views, gain some insights, find some inspiration or even to learn something about ourselves. Last night in Middleton it would be fair to say that watching and listening to Lemn Sissay we were privileged to find all of the above in abundance along with real depth of emotion and not a few laughs. The newly appointed Chancellor of the University of Manchester was on brilliant form and shared much of his own story and experience along with a great selection of his poems. In his own words he tends to be “non-linear” and in what appeared to be unrehearsed asides he would drift from the introduction to one of his poems into a chat about something from his life and then back again to eventually read the poem. Both his poetry and his comments were absolutely crammed with terrific insight and a great understanding of life. Having been brought up in care he has a great understanding of the effects that the care system can have on young people and his thoughts on the Red Box (the “Break Glass in case of Fire” boxes) ought to be compulsory reading for all working on the care system as well as anyone involved in teaching young people. He spoke a great deal about the need for affirmation which we all share and the validation that family, and the search for family, can sometimes offer. Alongside stories about his ethnic origin, the meaning of his name and some of the many places where he has performed he did of course read plenty of his poems. There were poems about inequality, sad poems, happy poems, a short poem “My dad is a pilot” about his Nigerian father, a single love poem “Invisible kisses” and even a children’s poem. 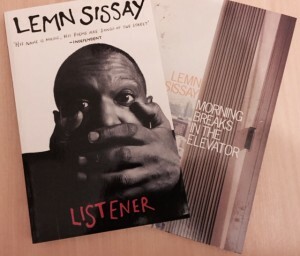 Lemn Sissay’s face is elastic, his voice madly flexible and his hands expressive. This was truly inspiring performance from a man who seems to thoroughly enjoy sharing, who has a quick incisive mind and wit and delivers it all in such a natural manner with little sign of an ego. If a poet, a child grown up in care, a man with a social conscience and a man who exudes belief and equality; if such a man can be a university chancellor then maybe we really can make the world a better place. I’m seriously enjoying dipping into the books I just had to bring home with me. 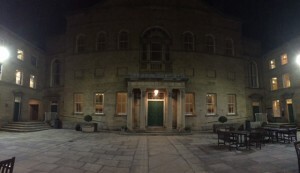 The event was part of Rochdale’s Literature and Ideas Festival 2015. Last week I did something very unusual for me; I wrote a poem directly onto my computer, no rough ideas in my notebook, no scribbled alterations, just straight onto the computer and then edited a few times. There will be a few more edits for certain. I don’t think this will be a regular thing as the process felt less comfortable than the one I usually use. On the other hand once I had the idea I decided I wanted this poem quickly to be able to share at a particular event and I must admit the computer only process took less time overall. Well the audiences at 2 events gave it a pretty big thumbs up. What does all of this mean? To me it serves as a reminder that there are very many different ways to turn thoughts and ideas into finished writing and poems and that even for the same writer different methods are appropriate and helpful at different times. The poem itself talks about being an outsider through differences over the years, in this case using the difference from those following and perhaps idolising the more prevalent and popular music of the time. 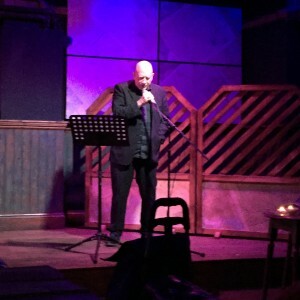 Thursday 8th July saw second of the Rochdale Fringe Festival events, in the lead up to the Rochdale Literature and ideas Festival, and the final Baum showcase performance from Norman Warwick. 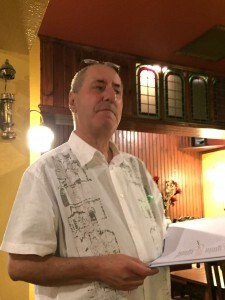 As I said in my introduction this was a man who needed no introduction; Norm has been a mainstay of the Rochdale arts scene especially through All Across The Arts, Just Poets and the Touchstones Creative Writing Group. There are many writers and artists who have gained so much from working with, being encouraged by and promoted by Norm through the wide range of events, workshops, newspaper column, radio show and his enthusiasm to offer advice, critique and do whatever he can to contribute. Many of us turned out at the Baum to listen to Norm who was welcomed with a proper Rochdale Rapturous Round of applause and he certainly didn’t disappoint as the whole room laughed along as he told us of a first trip to the barbers, felt the love and hope as his miner dances with the goddess from ‘off the silver screen’ and were moved by his performance of “Lost in the fadeaway diamond time” telling us of the lost of his dear friend and songwriting superstar Townes Van Zandt. With an open-mic style read around (see pics below) Norm and the audience were regaled poetry and prose from young and old with tales of life from the mundane to the fantastic (or perhaps ridiculous) with a range as varied, entertaining and powerful as we’ve come to expect at this venue. Great stuff! As Norm heads off to a sunnier retirement he is not likely to stop inspiring, entertaining and supporting artists and Rochdale’s loss will be Lanzarote’s gain. Meanwhile it falls to those of us remaining to ensure that we continue to have a thriving, developing and welcoming arts scene in Rochdale into the future building on foundations to which Norm has contributes so much over the years. Dave Morgan (above) was up first, the most difficult slot in a slam and a chance for the judges to settle. 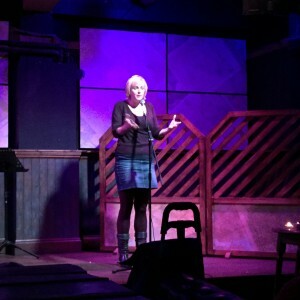 I was fourth or fifth and unlike my previous go at a slam I didn’t feel too nervous. After an interesting first half with really diverse poems 5 poets with the highest scores had qualified for the final. I wasn’t either too surprised or too disappointed to find myself in the other half; realising that my style lends itself more to a different and less competitive style and learning more about what it takes to deliver a potential winning poem. The final saw many high scores but at the end the highest scores were awarded to Rose Condo who, in agreement with the judges, I felt was the strongest performer of the night. Rose will now have a place in the Manchester based final of the Commonword Super Heroes of Slam. 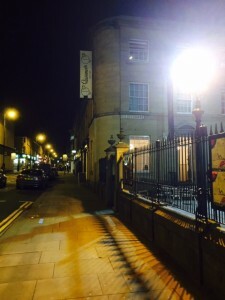 Julian was right; this is the blood sport of poetry but it was also a great night out and credit to the newish venue Bar 1:22 in Huddersfield which is likely to find itself hosting spoken word more frequently in the future. I said in a previous post (3rd August) that entering the slam would be stepping outside my comfort zone trigger some creativity and give myself a deadline. All of that turned out to be true but as the day of the slam approached I stepped much further outside my comfort zone, gave up that day job, started establishing my own creative business and re-registered with agencies do some part time teaching. I’m writing as much as I can, creating some new workshops, developing new images for sale, making and remaking contacts and getting out on the poetry scene as much as I can. It is a bit scary, it is exciting and although outside of the norm, out of my comfort zone and a bit precarious it has made me feel rejuvenated, more comfortable and sane than I’ve felt for ages and I find myself looking forwards – wondering just how far I can go rather than whether to go at all. So if anyone needs a facilitator, a compere, a poet, needs some workshops, needs some commissioned writing, wants some new images or just some inspirational words just give me a shout….